Ordering Information | EMAC Inc.
New Year's Day, Good Friday, Memorial Day, Independence Day, Labor Day, Thanksgiving Day, and Christmas Day. Domestic ordering policies apply towards orders in USA, Canada, or Mexico. Provide your name, company name, address, email, and phone number. List the products you wish to order with part numbers and price. Specify desired method of payment (DO NOT email credit card information). Specify desired method of shipment. For International orders, please view our Internaltional Ordering information. Prepay with a Company or Personal Check (drawn from a USA bank). Payment must be in US Dollars and clear our bank before EMAC can ship the order. Visa, Mastercard (call or fax only). Subject to Restictions. Checks, transfer notices, and money orders drawn from international banks without an operating branch in the USA are not accepted. Shipping Charges are calculated based on UPS shipping rates. These fees are based on dimension, weight, value, and the number of packages. EMAC, inc. ships to the United States (including Alaska and Hawaii) and most U.S. Territories. Domestic orders are sent via United Parcel Service (UPS). When your order is completed and has been picked up by UPS, a confirmation email is sent to the email address you have provided. Included in that email is a UPS tracking number. If you do not receive your UPS notification, please check your spam folder or contact our Customer Service Representatives at 618-529-4525. You will receive your UPS Ground order within 3-7 business days after it ships. UPS will e-mail you a tracking number when your order ships. Army Post Office (APO) and Fleet Post Office (FPO) addresses are not accepted by UPS. UPS requires a signature upon delivery ofr shipments over $400. For UPS Residental Delivery, add $5.00. PLEASE NOTE: To ship same day, the order must be entered and available to ship by 10:30 AM CST. All orders entered after 10:30 AM CST will ship the following business day. Please be certain to speak with a sales representative about lead time and availability before placing your order. Guaranteed Overnight Delivery by 10:30 a.m. UPS Next Day Air features fast, reliable delivery to every address in all 50 states and Puerto Rico making it the right choice for all your overnight shipments. It provides Next-Day service on weekdays. Service is not available for Saturday or Sunday delivery. UPS will not provide service guarantee adjustments for late deliveries due to inclement weather. Guaranteed Second-Day Delivery. On-time delivery throughout the U.S. and Puerto Rico by the end of the second business day. This is an economical alternative for time-sensitive shipments. Service is not available for Saturday or Sunday delivery. UPS will not provide service guarantee adjustments for late deliveries due to inclement weather. Intra-Alaska shipments are not guaranteed. Guaranteed Three-Day (business days). Delivery offers the ideal mix of economy and guaranteed on-time delivery within the 48 contiguous states. Service is not available for Saturday or Sunday delivery. UPS will not provide service guarantee adjustments for late deliveries due to inclement weather. EMAC cannot provide evaluation/demonstration units to customers outside of the United States of America. The customer is responsible for paying all taxes, duties, tariffs, and customs fees. International orders cannot be drop shipped and invoices cannot be changed to reflect a resale price. Freight Forwarders may be used, but all arrangements for shipping must be made with the freight forwarder and not with EMAC. All International orders outside of the United States, Canada, and Mexico require a quotation prepared by our Sales Department. International Credit Cards may be used by approved customers whose order totals less than $750 including all Shipping Fees. For orders totaling $750 or more we require pre-payment via wire transfer. See our Wire Transfer Procedure. Checks, Transfer notices, and Money Orders drawn from International Banks, without an operating Branch in the United States are not accepted! All of prices on our website are in US Dollars and are subject to change without notice. Please Note: These commodities, technology, or software are exported from the United States in accordance with the Export Administration Regulations. Diversion contrary to U.S law is prohibited. • A returned merchandise authorization (RMA) number must be issued for all returns. • All returns not relating to manufacturers' warranties, returns must be made within 30 days of date of invoice, with valid RMA number. • When returning product, place RMA number on packing slip & shipping label only. Do not write RMA number on boxes. Use a shell or outer box to avoid damage in transit. • Product must be returned in its original packaging including all accessories, cables, bags, CD’s, manuals and copy of original Invoice. • Credit will be issued only for returned items which reference an RMA number. If there is a problem or delay issuing credit, the tracking number must be provided to EMAC. • Product must arrive at EMAC within 30 days of the RMA being issued. • Items received outside of stated timeframe or in unacceptable condition will not be credited and will be returned to sender at Customer’s expense. • Refused shipments must be reported to EMAC within 2 days of refusal; refused shipments will be charged all shipping fees. • A restock fee will be charged on all incomplete product returns which EMAC can make factory complete. • Incomplete product return restocking fees will include an itemized list of deficient items and a partial credit will be issued. • A minimum 20% restock fee will be charged on all returns not related to a 30 Day Evaluation Agreement or D.O.A. returns. • Cross shipment of RMA product must include a replacement Purchase Order and your account must be in good standing. • The Customer is liable for the condition of the returned product. • If a product returned as DOA is tested and there is no problem found, Customer will be subject to a $50.00 fee. • Approved RMA’s will be credited to your normal credit terms with EMAC. • All ESD sensitive devices will undergo a incoming inspection to evaluate for shipping damage and to determine if the product has been handled in a manner to protect it from accidental ESD damage. Product that does not arrive in ESD protective packaging will not be eligible for replacement or credit. • Special Order, custom configured, NCNR, discontinued or obsolete products. • Products that have been used, modified or damaged. • Original box is missing, damaged, or original packaging is defaced with writing or markings. • Product is missing packaging, manuals, or other components. • All software products, intellectual property and media, including software licensing, engineering fees, software and configuration fees. • Products not purchased from EMAC. • RMA’s issued over 30 days prior to receipt. • Referencing RMA number is not included with the return. • Product shipped with other than factory default settings (includes configuration changes per Customer request). • Serial numbers removed, defaced or do not match the referenced invoice. • Custom Media of any type. • D.O.A. Product is defined as a product that failed to perform right out of the box. If a unit arrives in working condition is damaged by incorrect handling, usage or connection or operates for a period of time and then fails, it is considered a warranty claim. • D.O.A. is not a valid reason for a return. Reseller must provide details of D.O.A. • D.O.A. products can be returned within 30 days of invoice. • Defective or D.O.A. products must include an RMA number. • Defective product older than 30 days is covered by the manufacturer’s warranty. • All Products returned that do not meet specified requirements will be returned at customer expense. • Damaged goods must first be inspected at destination by the freight carrier, retain all packaging for inspection, and review. • Claims for goods damaged in transit must be received within 10 calendar days of shipment, and include clear photographic documentation of packaging. • Claims are handled between EMAC and the carrier, outside of normal RMA procedure. • An RMA number will be given to the Customer upon notification. • A call tag or EMAC’s shipping account number will be used for return of products via ground shipping to EMAC. Customer pays for shipping to EMAC. If product is D.O.A. or Manufacturer’s Defect EMAC will cover return shipping via UPS Ground. For all RMA’s that are found to be Non-Warranty Repairs, return shipping will be billed to Invoice or Customer Shipping Account. • Credit will be given after product is evaluated to be in resalable condition with original boxes and all packaging, materials and accessories. • Credit will be issued only for returnable items which are approved and received referencing an RMA number. If there is an issue, problem or delay in receiving credit, please contact the RMA coordinator with the RMA number and your tracking number must be provided to EMAC. • Items that arrive at EMAC without a valid RMA number will be refused at the dock, or shipped back, at the sender’s expense. • RMA number will be issued after confirming the product to be returned meets all return requirements. • All product returns must be insured and sent via a carrier that provides on-line tracking. • Return freight charge must be prepaid. Sorry, freight due and C.O.D. returns cannot be accepted. • If product is returned it will be shipped at Customer’s expense, unless an EMAC error has occurred. • RMA numbers must be listed on the shipping label, not on the product packaging box. For additional information on return policies go to: RMA and Warranty Disclaimer. 1. Software Licenses and any products that contain custom parts are NCNR and cannot be canceled once the order is confirmed. 2. Scheduled shipments may be considered NCNR or be subject to a restocking fee if cancelable. 3. Most orders or quantities may be pushed out up to 2 months provided EMAC is notified in writing 1 month or more prior to the scheduled ship date. 4. If a request is made of EMAC to push an order out that is between two weeks and 1 month from its ship date, EMAC may push this date out a maximum of 1 month. 5. No aspect of an order may be changed within the two week window of the ship date. 6. 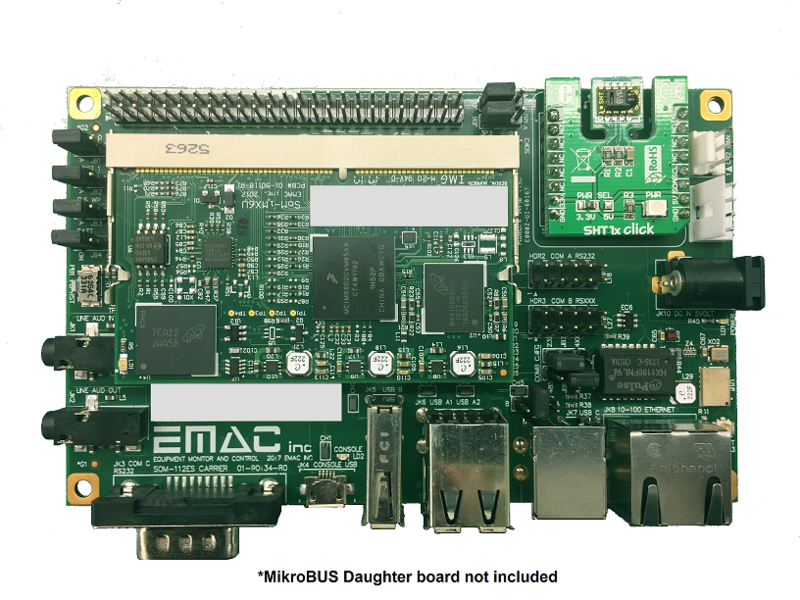 Orders may be pulled in provided EMAC is notified in writing 1 month or more prior to the scheduled ship date and vendors can provide the parts to EMAC early enough to meet the request. 7. Any change will be followed up with a new or revised PO once the change has been confirmed by EMAC. 8. Orders must be completed within 6 months of initial delivery.